President Nicolas Maduro has called on his Surinamese counterpart to convene a meeting of the Union of South American Nations (Unasur) to discuss the ongoing street protests in Venezuela. Surinamese President Desi Bouterse is the current Unasur chair. Venezuela’s request comes a day after relations appear to have soured with Panama, which Maduro said had betrayed his country by calling for a meeting of the Washington-backed Organization of American States (OAS). On Wednesday, Caracas gave senior staff at the Panamanian embassy 48 hours to leave Venezuela. The death toll from a month of demonstrations reached 20 on Thursday after a civilian and a police officer were killed in clashes. Venezuela plunged into turmoil when street protests began on February 4 with demonstrators demanding an end to rampant crime, shortages of basic goods and arrests of activists. Nearly two weeks later, Maduro expelled three American consular officials from Caracas, accusing the United States of conspiring with anti-government protesters to overthrow his ten-month old rule. “Let them go conspire in Washington,” Maduro said at the time. The president said the diplomats, who were not publicly identified, had been meeting with student leaders at universities to fuel their anti-government rage. The expulsion, however, is largely considered a retaliatory measure for recent comments made by officials in Washington who had condemned the Venezuelan government’s reactions to protests. Maduro refused what he called US interference in Venezuelan affairs, especially after the Obama administration’s public endorsement of his contender Leopoldo Lopez, one of the main figures of the opposition movement. 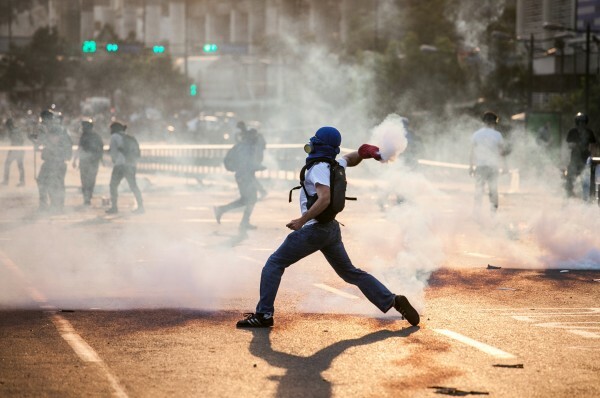 Last week, US Senators Marco Rubio and Bob Menendez introduced a resolution condemning the Caracas government’s treatment of protesters and calling for targeted sanctions against Maduro and other leaders.